Patristic sources often link Mary, the mother of Jesus, to ark of the covenant imagery. Where did this tradition originate? At first glance, it might be suspected that such language is merely the result of reckless allegorization. After all, the New Testament never links Mary with the ark . . . right? Here I want to make the case that the imagery of Mary as ark can be found in Luke’s Gospel. In particular, I want to look at a story relevant to the Christmas season: Luke's account of the Visitation, i.e., Mary's visit to Elizabeth. The story is rich in Old Testament echoes. As we shall see, it seems the fathers were much more careful readers of the New Testament than is often realized. This should raise a few eyebrows. Please let me know what you think in the com-box. First, let me establish the assertion I made above, namely, that patristic writers linked Mary with the ark. A few citations will do. Note that this is by no means an exhaustive survey. Hippolytus (c. a.d. 170–c. a.d. 236): “At that time, the Savior coming from the Virgin, the Ark, brought forth His own body into the world from that Ark, which was gilded with pure gold within by the Word, and without by the Holy Ghost; so that the truth was shown forth, and the Ark was manifested....And the Savior came into the world bearing the incorruptible Ark, that is to say His own body” [Dan .vi]. Athanasius of Alexandria (c. a.d. 296– c. a.d. 373): "O noble Virgin, truly you are greater than any other greatness. For who is your equal in greatness, O dwelling place of God the Word? To whom among all creatures shall I compare you, O Virgin? 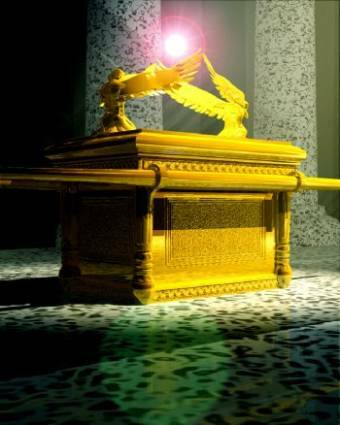 You are greater than them all O [Ark of the] Covenant, clothed with purity instead of gold! You are the ark in which is found the golden vessel containing the true manna, that is, the flesh in which divinity resides" (Homily of the Papyrus of Turin). Gregory the Wonder Worker (c. a.d. 213– c. a.d. 270): "Let us chant the melody that has been taught us by the inspired harp of David, and say, ‘Arise, O Lord, into thy rest; thou, and the ark of thy sanctuary.’ For the Holy Virgin is in truth an ark, wrought with gold both within and without, that has received the whole treasury of the sanctuary" (Homily on the Annunciation to the Holy Virgin Mary). John Damascene (c. a.d. 676–c. a.d. 749): “This day the Holy and Singular Virgin is presented in the sublime and heavenly Temple… This day the sacred and living Ark of the Living God, who bore within her womb her own Creator, took up her rest within that temple of the Lord that was not made with hands… And David her forefather, and her father in God, dances with joy…” [Oration on the Glorious Dormition of the Most Holy Mother of God the Ever-Virgin Mary, 2]. In Luke 1 we read about Mary’s journey to visit her cousin Elizabeth. We read that “Mary arose and went with haste into the hill country of Judah” (1:39). When she arrives, Elizabeth “exclaimed with a loud cry, ‘Blessed are you among women’”(1:42). Elizabeth asks, “And why is this granted me, that the mother of my Lord should come to me?” (1:43). She states, “For behold when the voice of your greeting came to my ears the babe in my womb leaped for joy” (1:44). After Mary responds with a long prayer praising God we read, “And Mary remained with her about three months” (1:56). At first glance it seems that there are no clear Old Testament allusions in any of this—after all, no specific passage is cited. However, a more careful look reveals numerous Old Testament allusions in the story. Among other things, the line “Blessed are you among women” (1:42) clearly evokes Deborah’s prayer (cf. Jdg 5:24). Likewise, scholars have detected numerous links between Mary’s prayer in the story and Hannah’s in 1 Samuel 2. Luke is clearly subtle in his use of the Old Testament; he does not need formula quotations. Yet what I want to focus on here are the allusions to the story of the ark’s journey to Jerusalem in 2 Samuel 6. There we read about David’s bringing the holy vessel into the newly conquered city of Jerusalem. In the beginning of the chapter we read about David’s first attempt to lead the ark into Zion—an attempt that is aborted after a man dies for touching the ark. Indeed, the first attempt seemed doom to failure from the get-go: the ark was carried on a cart, rather than being properly carried on poles (2 Sam 6:3; cf. Exod 37:4). It is only after the cart tips over that Uzzah puts his hand to ark, presumably, as a last ditch effort to save the ark from hitting the ground, and dies (2 Sam 6:6–7). The ark remains at the house of one “Obededom” for a period of time before, after the man's house is blessed, David decides to bring the ark into Jerusalem properly (cf. 2 Sam 6:11–12). 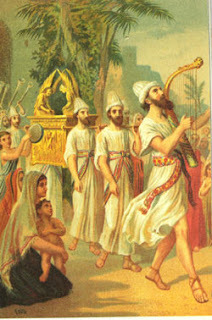 This time the ark is properly “borne” by the Levites (2 Sam 6:13) and David leads the ark in a glorious procession, which involves him offering sacrifice and blessing the people (cf. 2 Sam 6:16–19). The parallels between the ark’s journey in 2 Samuel 6 and Mary’s journey in Luke 1 are striking. Indeed, the language in Luke 1 mirrors that of the LXX. Both “arose” in are linked with the region of Judah. “Mary arose [ἀνίστημι] and went with haste into the hill country of Judah” (Luke 1:39). —“And David arose [ἀνίστημι] and went with all the people who were with him from Baale-judah” (2 Sam 6:2). In both stories a “blessing” is pronounced. “[Elizabeth] exclaimed with a loud cry, ‘Blessed [εὐλογημένη] are you among women’”(Luke 1:42). —“[David] blessed [εὐλόγησεν]the people in the name of the Lord” (2 Sam 6:18). Both Elizabeth and David ask how they are worthy to be in the presence of the Ark/Mary. “And why is this granted me, that the mother of my Lord should come to me [ἵνα ἔλθῃ ἡ μήτηρ τοῦ κυρίου μου πρὸς ἐμέ]? (Luke 1:43). —“[David] said, ‘How can the ark of the Lord come to me [Πῶς εἰσελεύσεται πρός με ἡ κιβωτὸς κυρίου]?’” (2 Sam 6:9). “Leaping” occurs in both stories. “For behold… the babe in my womb leaped [ἐσκίρτησεν] for joy” (Luke 1:44). —“Michal . . . looked out the window and saw David leaping [MT: pāzǎz] and dancing before the Lord” (2 Sam 6:16). Both Mary and the ark remain somewhere for “three months”. “And Mary remained with her about three months [μῆνας τρεῖς]” (Luke 1:56). —“And the ark of the Lord remained in the house of Obededom the Gittite three months [μῆνας τρεῖς]” (2 Sam 6:11). These parallels are, in my opinion, very difficult to dismiss as mere coincidence. In other words, it seems more likely that Luke is drawing on 2 Samuel 6 than that these similarities are present by chance. The upshot of it all appears to be that Luke describes Mary's visit to Elizabeth in terms evocative of the ark’s journey to Jerusalem. In other words, Luke seems to describe Mary as the new ark of the covenant. Interestingly, both "ark of the covenant imagery" and that of "the mother of the Messiah" also appear to be linked in the same context in other place: the Apocalypse. In Revelation 12 we read about a woman who gives birth to a male child who rules the nations “with a rod of iron” (Rev 12:5). The language is clearly Davidic and is obviously drawn from Psalm 2. In sum, the child born is clearly the messiah. The woman is therefore—whatever else she may be—the mother of the messiah. Incidentally, I might also note that many commentators see Isaiah 7:14 in the backdrop of Revelation 12, a passage also linked with Mary in the New Testament. It would seem then that the patristic writers were not without precedent in linking Mary with the ark—the New Testament contains at least two places where the connection is made. Reckless allegorization or insightful contemplation? Clearly, the latter. Of course, if the new covenant is superior to the old covenant, it would also seem that the ark of the new covenant would exceed in holiness that of the old. In light of this, the early church’s affirmation of Mary as panagia, i.e., “all-holy,” makes good sense. "And the temple of God was opened in heaven: and the ark of his testament was seen in his temple. And there were lightnings and voices and an earthquake and great hail. And a great sign appeared in heaven: A woman clothed with the sun, and the moon under her feet, and on her head a crown of twelve stars. And being with child, she cried travailing in birth: and was in pain to be delivered." Why does the vision say the woman had birth pangs, when we believe in the virginal birth? Anaphone is a very rare Greek word used in the account. (Luke 1:42, NT hapax legomenon) Mary shows up and Elizabeth “cries” (anaphoneo) with a loud voice. 1Ch 15:28 And all Israel brought up the ark of the covenant of the Lord with shouting, and with the sound of a horn, and with trumpets, and with cymbals, playing loudly (anaphoneo) on lutes and harps. 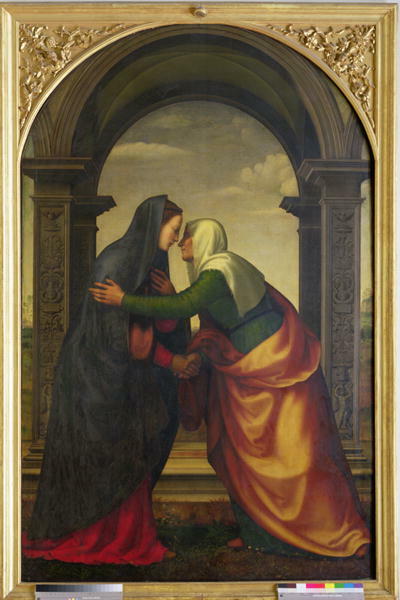 This is a unique link between the Visitation and the Ark's procession in the OT. Edward Sri's great little book, Dawn of the Messiah really helped me to see this idea. There's one other angle though that I think makes more sense in light of the parallels from 2 Sam. 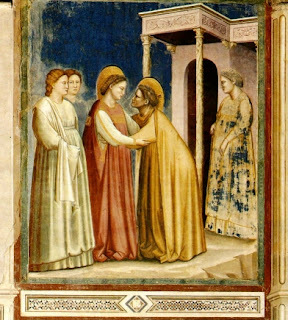 When Mary shows up to go help Elizabeth, her greeting to Mary seems a bit out of place for an older relative to greet a young woman. This is made more obscure by the fact that it is a younger relative who was pregnant, without any ostensible explanation. I know that, in my own Mexican heritage, when I greet an older person, I'm supposed to be the one whose words are overflowing with compliments. But in Luke it seems the opposite is true. If, however, Elizabeth is clued in to the fact that Mary is now raised above the Ark in importance, that would explain things a bit more. also pertinent as it is foundational for the Assumption is Psalm 132:8 "Arise, O Lord, and go to thy resting place, thou and the ark of thy might." We might look also at the miracles that happened at the presence of the ark, like the parting of the Jordan River in Joshua 3. The procession of the ark around Jericho also can be seen as a litugical action which saves the people and destroys the enemy. The recent 1st approval of a marian apparition in the US was because of the intercession of Our Lady in a time of peril where the people processed a statue of Our Lady around the chapel and they were spared from an impending fire. See the story at the dioces of Green Bay website. As Elizabeth was "Filled with the Holy Spirit", one is right to consider that her greeting in terms of being prompted by and enlightened by the third person of the Trinity. Elizabeth even acknowleges Mary as the "Mother of my Lord". Elizabeth, through that same Holy Spirit, did not know how it was that the Mother of God had come to her, but she knew that the God himself was in Mary's womb and that the Mother of God had just walked through her front door. So easy even a plow boy could understand it. What I want to propose now is that the question be framed differently. MIchael gave us two options: Is the patristic teaching about Mary as the ark of the covenant "reckless allegorization" or is it intended by the biblical authors? I see at least two other possibilities: (3) This interpretation is a theologically sound and biblically justifiable Christian typological interpretation of the OT, whether or not NT authors affirm it. (4) This interpretation is an orthodox and spiritually fruitful (even if allegorical) traditional actualization of a text, even if it cannot be shown to be intended by the biblical author or to be a legitimate typological interpretation. The point of enlarging the range of possibilities is that Catholics should be able to appreciate traditional interpretations that belong to these last two categories. They have value and are inspired by the Spirit in the Church, even if they lack canonical authority. They can and do build up the people of God. Criteria can be articulated to distinguish these from "reckless allegorization." 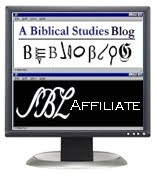 They have the advantage of delivering us from the Either/Or approach of having to prove they were intended by the biblical author, since only those interpretations are accredited. This arises from responding to a Protestant sola scriptura presupposition. It can cause us to lose sight of our Catholic appreciation for the work of the Spirit in and through Tradition. Sometimes, and perhaps this is one of those occasions, a fruitful patristic interpretation can't be proven decisively whether the biblical author intended it. Yet the interpretation has great value for Christian life anyway, and we Catholics have the blessing of being nourished by it, even if it doesn't satisfy the criteria of our PRotestant brothers and sisters. Nick, the woman in Revelation has multiple symbolic meanings. As Catholic Christians, we recognize her as the Blessed Virgin Mary; but she also represents both Israel and the Church. She is shown having "birth pangs" to make clear that she IS giving birth; it's also a warning to us to expect "birth pangs" in this world before Jesus returns. I agreed that the Church and the Woman in the scriptures refers to God's people. Those who believe in Christ as the new and true Ark of Covenant! Yet Mary is blessed by God and loved by people for ever and ever for, thanks to her faith, God gave us Jesus for the forgiving of sins and giving us an opportunity to be saved through Jesus and live for ever as He intended from the beginning! Hi I was in Panama recently and the ark of the covenant was discovered. The lost city of El Dorado is discovered in Chiriqui Panama. It is quiet interesting to see who is now taking responsibility for the exciting news. check out their link at http://thearkofthecovenantdiscovered.com/ Chiriqui archaeological sites. Exciting new news, revealed and exposed.